Jazz Festival: Jim Marshall is a lavish new book celebrating the legendary rock photographer's early work at the Newport and Monterey Jazz Festivals of the 1960s. Some 600 black-and-white images, most previously unseen, capture not only the musical icons of the time, but the freedom, excitement and intimacy of the events, whose integrated crowds led the way for the civil rights movement. Allan Campbell introduces a selection of Marshall's best shots. Jimi Hendrix setting fire to his guitar at Monterey. Johnny Cash flipping the bird at San Quentin. An out-of-it Janis Joplin backstage at the Winterland. Just a handful of the classic shots which made the late Jim Marshall the pre-eminent photographer of the rock era. No question. But back in the Fifties and early Sixties, Marshall was into jazz - big time. A force of nature, argumentative and generous, the hot-headed San Franciscan got his break by offering John Coltrane a lift. In return, the saxophonist let him shoot nine rolls of film. By most accounts Marshall would pretty much embed himself with musicians. And they trusted him. 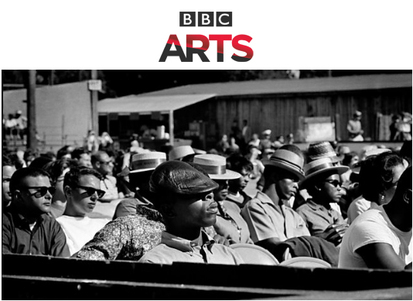 In 1960, when the latest anthology of his work - Jazz Festival - takes up, there were just two such events which really mattered; back east there was the Newport Jazz Festival on Rhode Island and out west the action was at the Monterey County Fairground in California. If that sounds po-faced then Marshall’s photographs are an antidote. He puts you close to the musicians and somehow, the music – the impromptu backstage rehearsals, the lost-in-the-moment blowing and the sheer joy of players finding themselves in the best musical company.